by Ed Roth. The girls and I broke into it this afternoon and there is tons of potential for great craftiness. The book includes twenty-five pre-cut and reuseable stencils as well as ideas and tips for using them. When I stenciled the tees, I laid a pad of paper inside the shirt and used pins, stuck straight into the thickness of the pad of paper, to hold the stencil in place. This was really helpful since I didn't have any type of spray adhesive to hold it and it also kept the paint from bleeding through to the back. Per the books instructions, less is more. I started out with just a bit of paint on my sponge, dabbing and layering on color, in order to keep the paint from soaking under the stencil. I used a hair dryer to dry the paint quickly before I removed the stencil and then again to set the paint. Tomorrow, I'll iron the reverse sides of the tees to really set it permanently. And in my opinion, this is definitely a crafty project for older children or adults. My girls only involvement was picking out what stencil they wanted and then being impatient while I worked. Beginning to end, with distractions, the two tees probably took my 15 minutes to complete. Now I'm feeling sassy and confident and thinking of putting a stencil above the doorway leading into the girls room or maybe even up the risers of their steps! And of course, the youngest of our clan had to get in on the modeling session as well. Everyone needs their turn standing on the chair. And apparently, after watching Mary, she determined that you were supposed to run your fingers over your stencil as part of the photo shoot. This girl watches her sisters' every move. And did you guess? I have not one, but TWO copies to give away! Leave a comment, I'll announce the two winners (plus the Birk winner) on Monday. And thank you, once again to Chronicle Books! Fun! Stenciling is such a great craft– requires so little talent! Oh, I’d love to try my hand at making stencil tees! 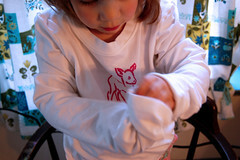 Oh, my girls have a few plain tees that would love to be stenciled. Ok, I am definitely pumped about this. I’m glad that we have some cool modern stencils these days. I have to chuckle when I think about the peach and blue stenciled border in my room in the 80s. This excites me so much!! What a fab book idea. I am a stencil fiend….but finding great ones is tough…Yay for giveaways. Those T-shirts look fantastic! 15 minutes, really? With three girls bumping around? I’m inspired. I picked up this gorgeous book, Printing by Hand, by Lena Corwin, that includes stenciling, screenprinting, and stamping. But a lead-up book, one with stencils I don’t have to make myself, would be a great first step for a mom with a preschooler and an infant and, you know, barely time to eat a sandwich. This is inspiring, fun, and just plain pretty. Blank t-shirts just scream to be stenciled on. This looks like fun! I have the ink! All i need is the stencil book. This looks great! So fast! I like that part too! Oh, I love this! The shirts look great. so totally cool! jane would love doing that! what a fun book – love stencils!count me in too please! Looks great – I would love to try it out. Oh, I’ve been eyeing this books for ages! Thanks for the great giveaways. Nice job with those T shirts. I can see me using that book with my daughters’ 4-H club. Oh FUN! I made freezer paper stenciled t-shirts for my whole family and sent them back to Australia for Christmas. They were a hit. Now I keep a look out for “blank” thirts to play on. Stencils are making a comeback! Would be a fun project to do for any family, thanks for the chance! how inspiring and fun! thank you for sharing! awesome! the shirts look great. What a fun-looking book– and better stencils than my sad freezer paper ones! the book looks great, the drawer of blank t-shirts that has been moving around the country just might get used with that book around. Good grief, the girls look absolutely adorable – who fun was that!!!!! That looks like a great book! Stenciling is great for those people that can’t draw like me. Oh what a good idea. The girls would love this project. And of course I love the horse shoe! I am so ready to be crafty with my twins! Those shirts are adorable! Wow! Seems like a great selection of stencils, I’d love to give it a go! Oh I need this. Just what I need for a wall I am thinking about in my home. And also, something good for crafting for boys! I always have a hard time coming up with cool things to make for my boys — this could be an answer. WOW! Birkis now stencils? Pick me. Oh how cool! Love the fawn – I’ll have trouble waiting to order this until Monday! Their shirts are great! I would love to win a book! They turned out really well. So cute. If I don’t win I might have to borrow that deer stencil! Wow! Such fancy stencils. Lovely. oh wow. this is great! if i dont win im going to have to pick one up anyway!!! thanks! We love to stand on chairs too. A new t-shirt would be just thing to wear on the next bench monday. What fabulous fun! I want to win!!! I haven’t stencilled in years, and would love to try my hand at it. I love the idea of putting the pad behind the tee shirt. One year, when my daughter was maybe 12 or so, we did tee-shirts at her birthday party. The girls painted and stencilled them, and we put pieces of plywood inside each shirt to keep them stiff. I think you can also buy cardboard tee shirt forms at a craft store. I love the idea of stencilling the risers of a staircase. That is a great idea. What an awesome giveaway! These stencils are adorable and can keep us busy for days! Wow I love the deer! We always talk about doing shirts together and never do. Maybe this could be my motivation! This would be a great way to make some fun t-shirts for my young son that we would both like. So many t-shirts for the young ones features pictures I don’t find appropriate for a 5yr.old. This would be great. Thanks! OK, I am thinking of projects to do with grandchildren here. Very nifty thing, Molly. This is a great idea for fun and quick projects! I love that the book comes with built in storage. Such a bonus! Looks like you created some adorable shirts. When does momma get one? I really love that Fawn!!!! so cute! Those would be so wicked cool for freezer-paper stenciling, which I can’t quite shake. . . I love it so. 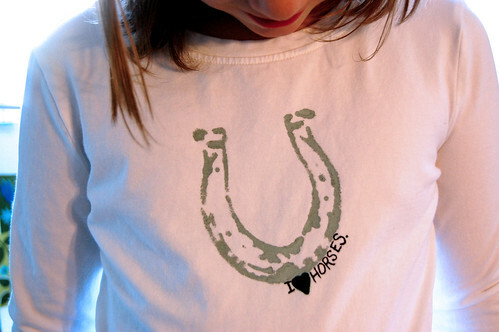 I have a little horse lover who would go bananas for that horseshoe shirt! Those look awesome. I love the horseshoe one! And she does too, of course. me! me! i want a stencil book! i’m planning my first foray into freezer paper stenciling tonight! Oooo! I’d totally take one of those! What fun! I’ve been wanting to try stenciling and this seems like an easy way to start. Cool! This looks awesome! Love stencils. That is awesome!! My little ones and I would have so much fun doing things with those stencil books!! Fun! The shirts look great. Love the tees and the bird stencils — just wonder if I have the patience?! ohhh — all kinds of fun! thanks for the opportunity! My little copies her sister, too — even when she’s getting in trouble for doing something she shouldn’t! What an awesome book – this is definitely going on my birthday wish list! Thanks for another great giveaway! Love the stenciling. Just tried my first applique on a T-shirt, this looks even simpler. I would love to use the stencils around the house too! Thank you. Okay, I have to have this book! It’s so hard to find fun and cool stencils! I have 3 munchkins that would love this. I might have to make something for myself too. Please enter me into the drawing. Thanks!! oh my. owning a book would be much easier than making my own stencils. Thank you. I would love to stencil up the walls in my place too. Maybe with washable paint so I can change it every week :). So stencil-tastic! I love it! Those stencils look great! I would love to give it a try. Looks like fun and would make great gifts for our handmade Christmas this year. Please enter me. Thanks for hosting the giveaway! I have been completely scared of stencils – but wow! Your projects look great. Maybe this IS something I can do – with the right stencils/tools, of course. Fun! 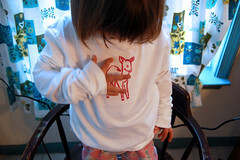 I love the fawn shirt! Oh I love it! T-shirts and walls look great! Thanks for sharing. I love stenciling. THis would be a great project. Cool! I like how yours turned out. looks like a fun project for home that would work in my first grade classroom too! While both my kids (two year old son and two month old daughter) are WAAAAY too young even to help with this, it would be a great naptime project – and something that I could make for them, rather than something in which I had no hand. 🙂 Thanks for the great idea! Oh my goodness! The options are endless with those stencils. Could I be so lucky? The shirts do look great! The stencils look great (and I think your model likes her shirt!). So glad I found your blog. This looks like a fun book, count me in! The t-shirts look fantastic. Would love this! This could be a very dangerous book for me… it looks addicting! 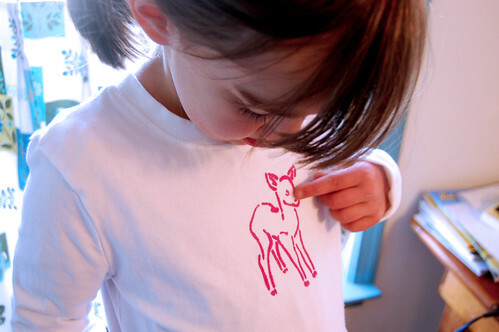 I was just stenciling t-shirts yesterday (using homemade stencils and the freezer paper method). Looks like a great book! Love this, I am useless at drawing so this is perfect! How fun is this! I can’t wait to get started on things for my daughter! My mother stenciled everything- and now i want to stencil too! oh wow!these look amazing.while reading i was already dreaming up designs.i do hope i win! this looks so fun! i’d love a chance! This is completely amazing–15 minutes! ooooh…. count me in! What a fab giveaway! How fun! My Nana used to do a lot of stenciling and I just love it. I haven’t stenciled anything in years, though. I think I feel a new project in my future! love this- I NEED IT! I’ve got the T-shirts all ready! Fingers crossed. Thanks for sharing. Nice! I’d love to win!!! The tshirts you used look like a nice quality, where are they from? It’s hard to find good quailty solid tees for kids.